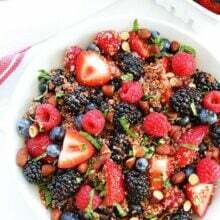 Berry Quinoa Salad-red quinoa with strawberries, blackberries, raspberries, blueberries, almonds, herbs, and a simple citrus dressing. This healthy fruit salad is a summer favorite! We decided to make a family summer bucket list and our list has me very excited for summertime. I won’t bore you with the entire list, but a few things include: visit the farmers market, make popsicles, hike Cecret Lake, go to an outdoor concert, fly kites, picnic at the multiple parks, host an ice cream party, go camping (Josh and Caleb), go to the zoo, go on family bike rides, and eat lots of s’mores. What’s on your summer bucket list? I am always trying to get my boys to eat more fruits and vegetables so I added eat lots of fresh summer produce to our bucket list. If it’s on the list, we have to do it:) We are off to a good start because I made a Berry Quinoa Salad and all of my boys gobbled it up. Maxwell was even reaching for more berries. For this salad, I used raspberries, blackberries, blueberries, and strawberries! They are all so good right now, so why not use them all? The more the merrier! I wanted to turn the berries into a substantial salad so I added quinoa to the mix. I used red quinoa because it is pretty with the berries, but if you can’t find it, you can use regular quinoa. 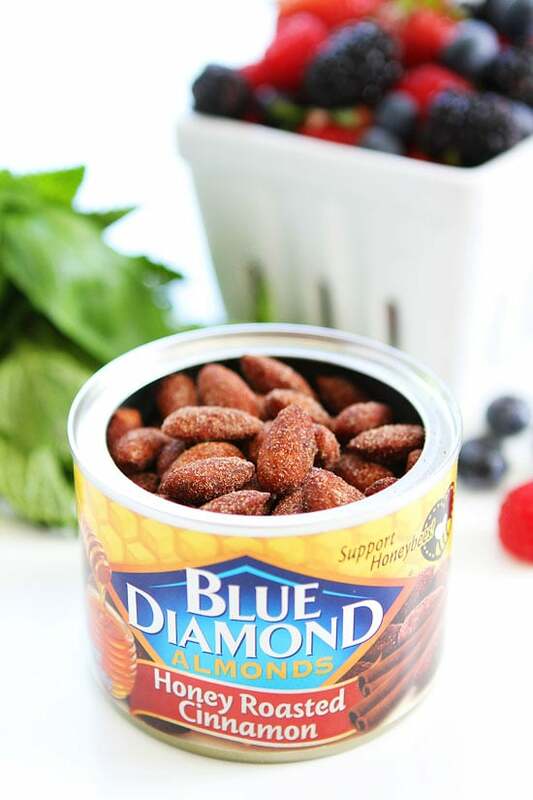 I also added Blue Diamond’s Honey Roasted Cinnamon Almonds. They are my favorite almonds. I could eat the entire can in one sitting. They add the perfect crunch and sweetness to the salad. Before serving, I added a simple citrus honey dressing and freshly chopped basil and mint. 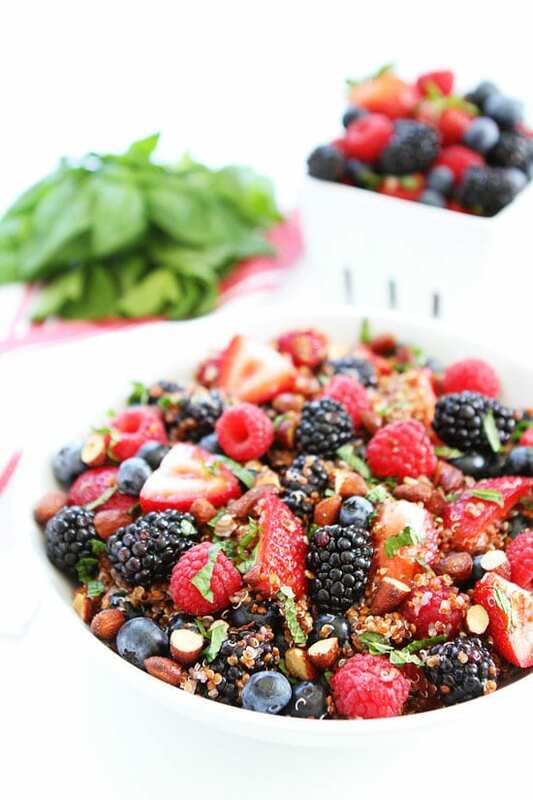 This Berry Quinoa Salad is summer in a bowl! I served the Berry Quinoa Salad as a side dish, but it would be good for breakfast or as a healthy snack. 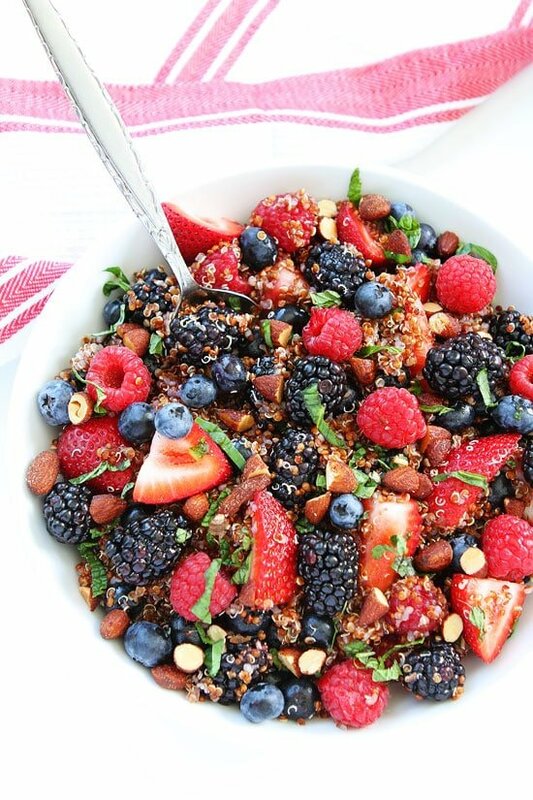 I love the protein boost from the quinoa and almonds and the berry medley is fabulous! 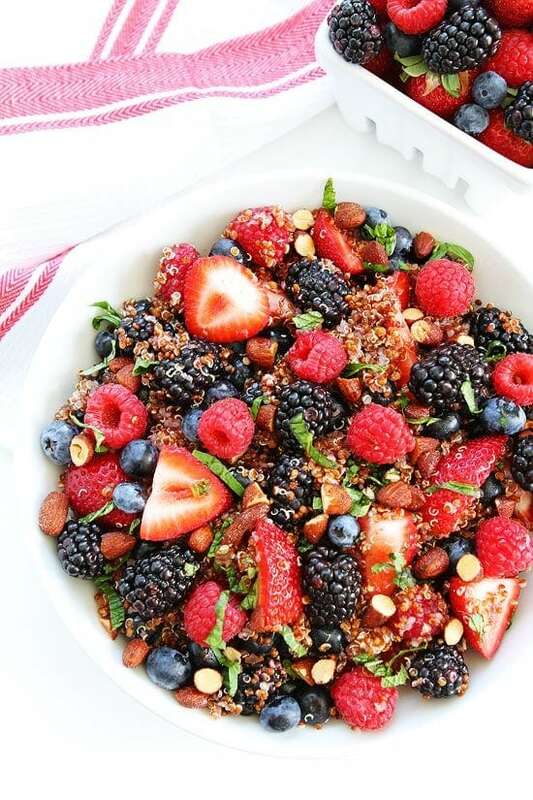 Make sure this Berry Quinoa Salad is on your summer bucket list. It is easy to make and the perfect fruit salad for summertime! This healthy fruit salad is a summer favorite! It is great for breakfast, snack time, or served as a side dish. First, make the dressing. In a small bowl or jar, whisk together the orange zest, orange juice, lemon juice, lime juice, honey, mint, and basil. Set aside. In a large bowl, combine cooked quinoa, strawberries, raspberries, blackberries, blueberries, almonds, mint, and basil. Gently stir. Drizzle citrus honey dressing over the salad and gently stir again. Serve. Note-if you can't find red quinoa, you can use regular quinoa. Cook the quinoa according to package instructions. The quinoa can be made in advance. Make sure it is cool before making the salad. The salad is best the day it is made. Disclosure-this post is in partnership with Blue Diamond Almonds, but our opinions are our own. Thank you for supporting the brands that continue to make Two Peas and Their Pod possible. This looks heavenly! 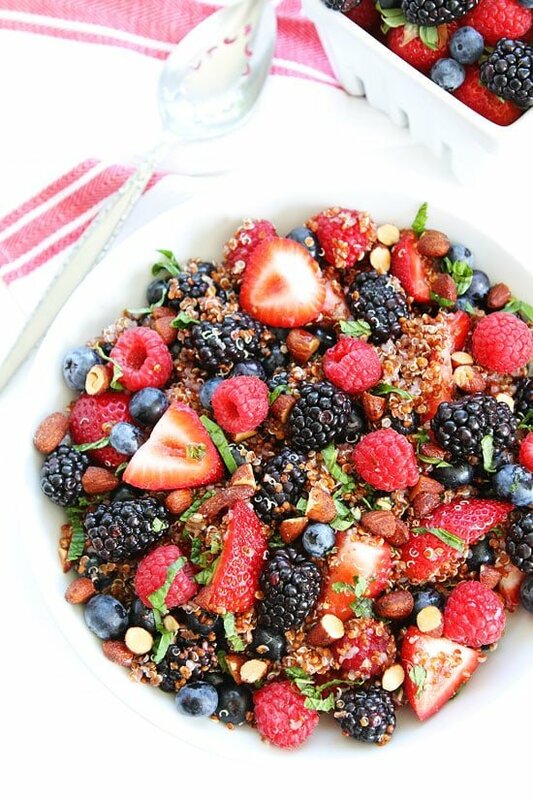 Mmm I love berries and quinoa, can’t wait to try this dish. 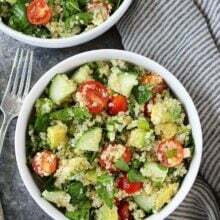 would love it if you could check out my blog: http://nicolesallsorts.blogspot.co.uk/ I like to write about healthy food options, makeup, beauty. This looks INCREDIBLE! We eat your Quinoa Fruit Salad quite a bit…looks like we’ll need to add this into the line-up! 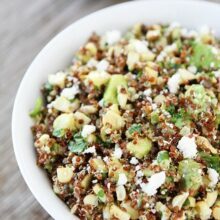 I have never tried red quinoa, but it has been something that is on MY bucket list. 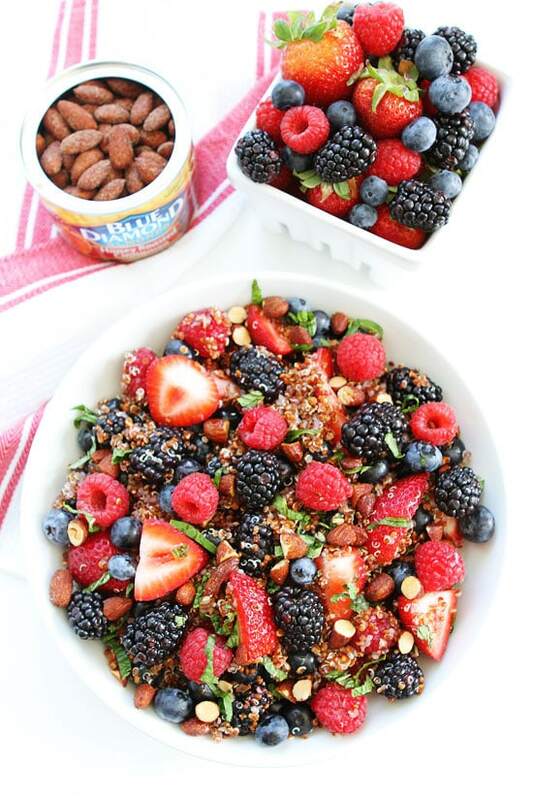 I am swooning over all those fresh berries with the crunchy, sweet nut goodness! Pinned! Sounds like quite the summer bucket list! Love the bike rides and s’mores:) Also, this salad, gorgeous!! This salad is BEAUTIFUL! I love that it is loaded with fruit. So full of delicious berries of summer!! I love almonds in salads! Love your bucket list! I need to start my own right now!! 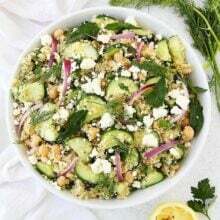 I love the look of this salad. I love the bright colors of the berries. It would be so fun to dig into that bowl. This is such a great recipe! I’m so addicted to those almonds, what a great way to use them! So good and so healthy -win,win! I love your bucket list – I may have to put my head together with the kids and write one up now that they’re officially on vacation. This salad is so beautiful, Maria! I am so happy it is berry season to see all these wonderful berry recipes!! This may just be my lunch for the rest of the week. Such a marvelous, healthy combination of ingredients. Delicious! I’ve been on a serious quinoa kick lately – but I haven’t yet tried it with fruits! This is beautiful! 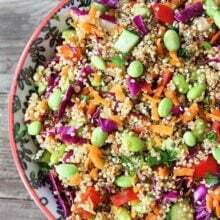 What a gorgeous, healthy quinoa salad! Incredible combination of berries! Perfect for summer brunch or Fourth of July entertaining. Love this Maria! Thanks Sandy! I am making it again for the 4th! I am OK with quinoa but I might try this with rice or orzo. Yum! This is going on my menu for dinner this evening. This is absolutely stunning, Maria! Love all that fresh fruit flavor! Brilliant idea! This is a whole new salad. 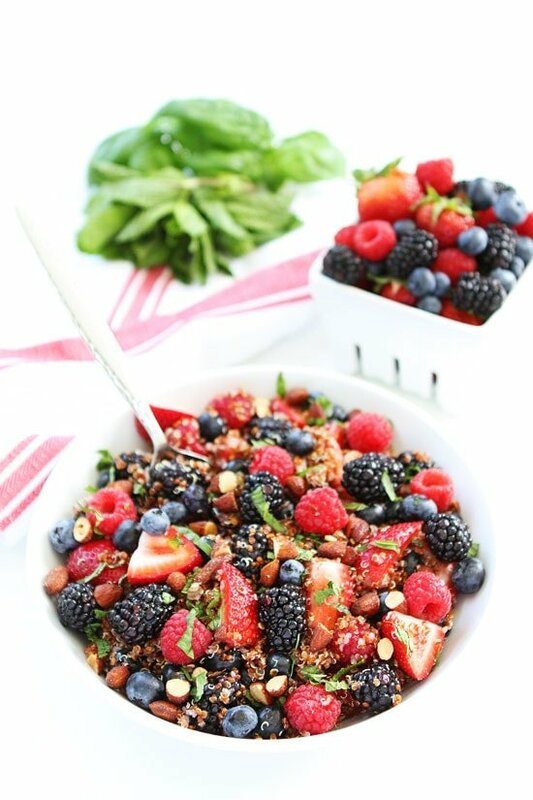 This berry quinoa salad could make a sad day turn into a shine and bright like diamond. I’m totally into it. Thanks for sharing this! You can leave them out and add more blueberries and raspberries. Pingback: 23 Easy Healthy Recipes That Will Actually Make You Love Salad... - Take control of your health! I’m thinking of serving this on a bed of greens. What do you think? I may double the dressing. Yes, adding greens is a great idea! You should state the kind of blueberries you are using,. I can ell they are wild blueberries, but some people may not. After all the wild blueberries taste much better. Where is the recipe?? I can put together everything but the dressing based on what is in the blog post… Help, please! Sorry, we are having some technical issues! We hope to have the recipes back up VERY soon! Sorry! Delicious — summer in a bowl! I served this salad plated, on top of a bed of dark leafy greens. Thanks for sharing! Can I put the dressing on in advance? Or should I wait until right before it is served? Made this today for my husband’s family reunion. Everyone LOVED it! I think next time I’ll try it with mango. This recipe was really delicious! And easy. And healthy. I heated some of it up and it was great that way, as well.